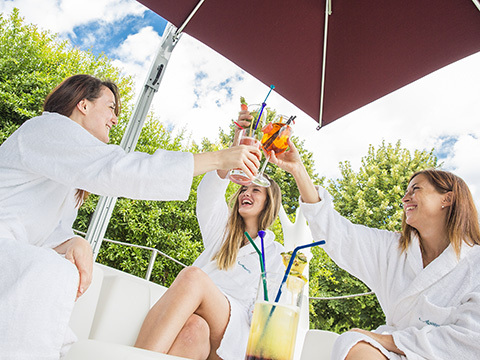 A wonderful setting to celebrate a special occasion, Aquaria is the perfect spot for a really original hen party, in total wellness and relaxation. Celebrate your special day or that of a friend with us. The bride-to-be enters for free! Thermae&Sauna access for 5 hours. Includes welcome kit. Valid for 5 people, including the bride-to-be, who enters for free! Give a toast at your reserved table with Prosecco and cake or, alternatively, with a savoury finger-food aperitif and Champagne. Offer valid for 5 people, including the bride-to-be who enters for free. The aperitif's start time will be 3 hours after the reserved entry time. If you choose the sweet option, the cake is a fruit tart. Gluten free and vegetarian alternatives are always available. Offer valid from 5 to 14 people, the whole day from Monday to Friday, Saturday after 6:00 pm and Sunday after 4:00 pm, excluding holidays. 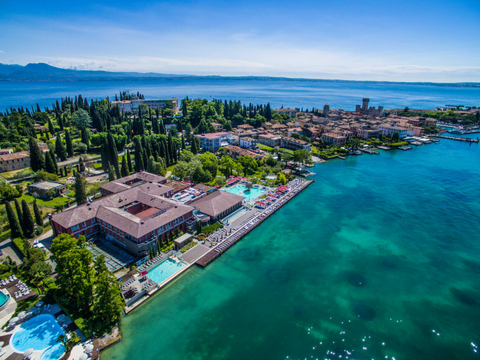 For groups over 15 people, we offer the exclusive SPA at Hotel Acquaviva del Garda. 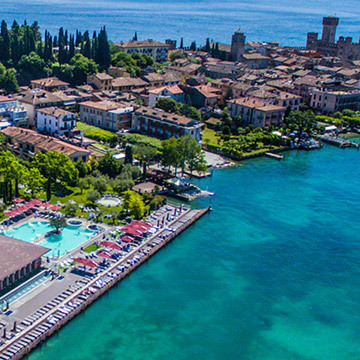 Right on the lake, in the middle of Sirmione’s historic centre.